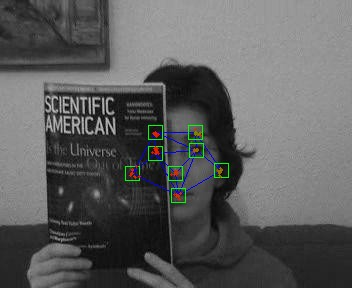 Object tracking is a substantial task for many computer vision applications such as human-computer interaction, automatic scene analysis, or action recognition. Single object tracking can take place at different levels of granularity (see Figure 1), ranging from single bounding-box estimates (top), articulated pose estimation with a few parts (center), up to dense deformable models with hundreds of parts (bottom). The part-based tracking problem leads to (discrete-)continuous models with a large number of variables and highly non-convex objective functions. Modeling and inference in this domain still remains challenging. 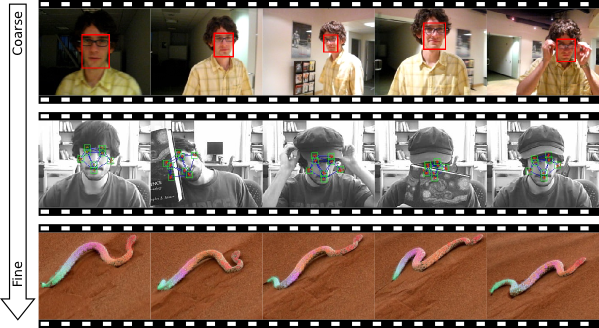 We use Probabilistic Graphical Model representations to solve the part-based object tracking task. Relationships between the parts are described by a factor graph. The (continuous) random variables encode the pose (x,y-location, orientation, and scale) for each part. We use stochastic inference techniques (see below) to solve the challenging non-convex problems. We use a stochastic inference technique to solve the relational feature tracking problem. As opposed to standard stochastic MRF inference techniques based on Metropolis-Hastings sampling or other heuristic proposal generators, we propose to use an efficient slice sampling approach which leads to a shorter burn-in period without sample rejection (see our slice-sampling paper). This project has been partially funded by the ERC within the starting grant Dynamic MinVIP.